McCourt Construction is a comprehensive general contractor, with strengths in utility infrastructure, heavy/civil construction, design/build projects, and accelerated schedules. Each year McCourt completes dozens of projects large and small. These jobs range from small utility digs to complex tunnel and bridge projects. In 120 years McCourt has never failed to complete a project. McCourt is led by fifth generation brothers Ryan, Matthew, and Trevor McCourt. Chairman Richard McCourt continues to take an active role in the company’s leadership. Vice President of Construction Steven Frick has been with the company for 34 years. Steve is currently Chairman of the Construction Industries of Massachusetts (the industry’s largest trade group). McCourt is committed to providing a safe work environment for our employees, customers, subcontractors and the public. We foster a safety culture by having safety representatives on site at every project. Employees attend mandatory continuous safety education sessions each year. McCourt Construction is proud of its “best-in-class” compliance program. Every employee is thoroughly trained in practices that adhere to the highest ethical and moral standards in the industry. 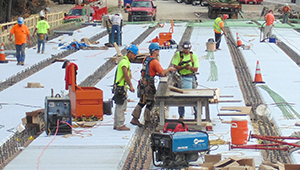 Click to view McCourt’s Project Portfolio, Press, Awards, or learn more about our services.